Business Truth: Your business will face uncertainty. So what do successful business owners do when it’s an “off” year? #1. Streamline your “Systems”. A “System” is essentially a process for how you accomplish a task in your business. Typically you document your systems in writing (ie your operating procedures), and use them to identify inefficiencies or opportunities for automation in your business. I have a system for client communication (and you should too), and I’ve chosen to share my E-mail Reply Templates to help give you a shortcut and you can find there HERE! #2. Assess your SWOTs. What are your Strengths, Weaknesses, Opportunities & Threats? If you only do 1 thing in an attempt to troubleshoot or plan ahead in your biz, I want to challenge you to take a few minutes to list out your SWOTs. (List as many as you can think of, but 2-5 per category is a good goal for a quick planning exercise.) What are you doing really well?…Which areas “need improvement”? How can you address one weakness? And…What can you do to accentuate your strengths? When things feel “off”, it’s essential to take an honest look at what’s going right and what threats or weaknesses you can address. You cannot improve what you do not measure! #3. Update your website. I say this ALL THE TIME, but that’s only because it’s truly effective. If you have your most recent pictures on Instagram, but they’re not on your website yet, make updating your gallery a priority! Does your About Page have a photo of you and/or your team? If not, then do that TODAY! I don’t care if it’s a professional headshot or a selfie of you in your studio or at your desk….just let me see your face! Your customers are hiring YOU….don’t be afraid to show your face. Improve your sales copy. This can be the trickiest aspect of website “stuff” for many florists, but the words you choose to use on your About Page, Weddings Page, Contact Page, etc. should be clear, concise and speak directly to your ideal customers. You’re not talking to “everybody”; you’re talking to the people who are most interested in what you do! Blog. Yup. Still this. Blogging. It’s STILL how you optimize organic SEO, develop the voice of your brand and share your most recent happenings with your fans and followers. If you need some tricks to make your website more engaging, you can get my BEST website secrets HERE. #4. Connect with other vendors. Perhaps it’s the mutual referrals that you’ll gain….or perhaps it’s simply a sense of friendship and camaraderie that benefits you both…but “seeking to get” cannot be the motivation. Seeking to connect should be the motive! You can choose to seek out a new relationship or simply check in with an established connection (perhaps someone whose work you respect, but you haven’t worked with much lately). 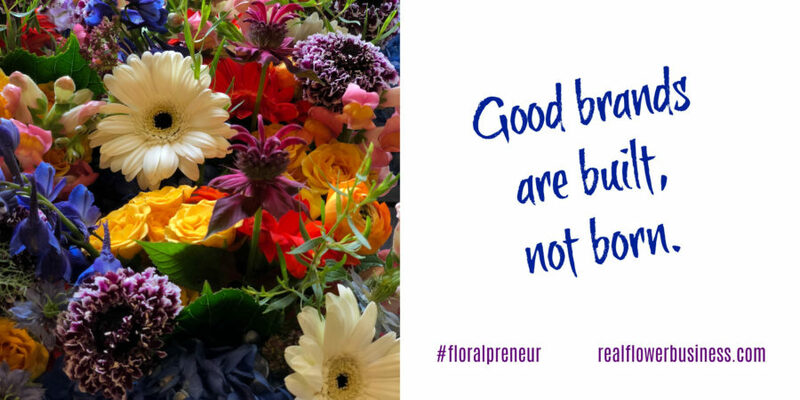 Fellow florists, photographers, caterers, venues, you name it….if they serve the clients you wish to serve, they have the potential to be a good connection…but make sure it’s a two-way street. People can sense when you “want something”….we ALL can tell when someone is reaching out to “get something from us”, but your fellow wedding vendors should be connections that you value and nurture…it’s not about what “they can do for you”, but about how you can help each other. #5. Shorten the turnaround time on proposals. If bookings are slow, it’s important to turn proposals around in a timely manner. The quicker you send it out, the quicker you book it, so don’t drag your feet on proposal writing! The trick is to give enough detail that the client can trust you, but not give away so much detail that it takes 5 hours to write and send a quote to a client who isn’t under contract yet. You can get my shortcut for writing proposals in less time here: How To Write Proposals That Sell and Book More Weddings More Quickly! Take some action in your business to plan for the future!…so you can keep doing beautiful work! After 17 seasons of running my home-studio business the reality of this is inescapable–at some point, every year, there is no “guaranteed” business for the next year. It may be a GREAT year in business this year, but next year’s success is still yet to be determined. When you design wedding work, but you don’t have a brick & mortar flower shop, the idea of “repeat business” tends to be out of reach because someone planning a wedding this year, isn’t going to be back again next year! And if you do run a brick & mortar shop, you have the ability to capture repeat business, but there’s daily stock & inventory to manage, employees you need to pay whether it’s a “good month” or a “bad month” and let’s face it, that’s a lot of pressure, too! So no matter how you slice it, a business venture brings uncertainty, stress and responsibility…. I hope you’ll take action in your business TODAY to keep reaching for your goals. Do you want to spend less time on e-mail replies? Do you ever track how many hours you spend replying to e-mails? I had no idea how much time I’d spend in front of my computer when I started my floral design business nearly 17 years ago. For YEARS I found myself struggling with how to tell someone I couldn’t hold their date without a deposit,…or firmly explain that I will not reduce my price,… or how to strike a balance on how “tough” to *really* get when requesting a payment that’s overdue. The reality of modern-day customer service is this: E-mail is a critical form of client communication; it’s how they get to know you! Your customers can’t see your facial expressions or interpret your “tone”… so it’s critical that every word you choose is meaningful and accurate. But it takes so much time to craft the perfect reply, right?!! It took years to hone my voice so it felt professional, authentic and clear. Do your e-mails increase your authority, grow trust with your clients, and make them feel well cared for? Increase the INCOME you’ll be able to generate when you state your minimums clearly so clients say YES to your next proposal, no questions asked! … Do you want these things in your business? feeling like your clients are in the driver’s seat…. For my wedding and event clients, I often send the same basic e-mails over and over again throughout the season, so after about 15 years in business I created 12 E-mail Templates for Florists with some of my most frequent (& sometimes tricky!) customer conversations, as well as 10 More Templates with Difficult Client Conversations Made Easy! 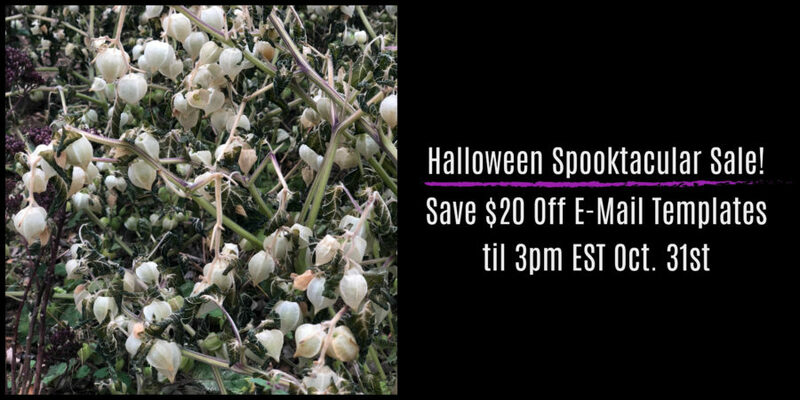 Now THRU Oct. 31 at 3pm Eastern Time THEY’RE ON SALE! SAVE $20 OFF BOTH SETS OF TEMPLATES WHEN YOU BUY A BUNDLE. Tell someone you can no longer “hold their date”. Present a proposal that’s over budget. Ask someone why they did NOT book with you. Tell someone you’re not a good fit for their event. Bill for damaged or missing rental items after an event. Explain you won’t order flowers until full payment is received. Tell someone that their most recent changes/additions will result in a price increase. Tell someone you will not update their proposal (again) or meet (again) without a deposit. Respond when a wedding is cancelled. Say, Hello in an introduction e-mail. Present a proposal, contract and invoice. Tell someone you’re unavailable for their date. Tell someone you will not lower your price. Follow up if you don’t hear back from a prospect. Tell someone you cannot hold their date without deposit. Confirm receipt of contract & deposit. Confirm receipt of contract, but missing deposit. Confirm receipt of deposit, but missing contract. Request final changes and final payment. Confirm receipt of final payment before event. Click here to grab my templates and start leveraging your e-mails to increase your confidence, authority, and income. This is the lowest price I’ve ever offered on templates! …so if there is even an inkling of a desire to grab these templates, jump on it right now. I’m closing the doors on this sale at 3pm EST on Oct. 31. Templates save you time! You can customize your own e-mail templates by modifying the language and phrasing provided in my templates. Simply create an e-mail folder for your most commonly used conversations, then, copy, paste into a new e-mail and adjust as needed to suit your client! Florists often tell me they use these e-mail templates the same day they buy them! Copy, paste, rinse, repeat!